Hope you are enjoying the first day of Autumn with this summer-like weather. I want to let you know that we will be changing things up this Sunday for our regular zazen session. 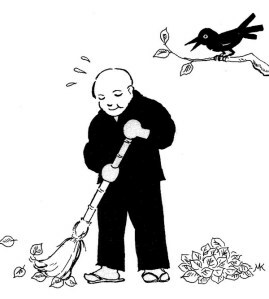 We will do a period of zazen and then will do some samu, mindful work practice. Since we've moved into our current site, we have had the fortune of so many folks coming to sit with us. All that sitting takes a toll on our cushions. The zafu cushion is the most important element of the zendo. It supports our bodies in zazen. The infinite merit encountered in zazen would be nothing without the zafu. Before and after zazen, we bow to the zafu because it does so much work for us. Sometimes, we need to do some work for the zafu. Sunday's samu is dedicated to providing the compassionate practice of strengthening our support, our zafus. We will do zazen, a short ceremony, and get to work on filling zafu cushions. It is not the most glamorous of work, but it is the most necessary. I hope that you'll join us. The work is a little messy, so wear some clothes you don't mind getting a little sweaty in (it is supposed to be pretty hot on Sunday). Thank you for your continued support of the zendo. your support brings life to the dharma practice here in Fort Greene. Food For Thought: Here is a link to a Dharma talk given by renowned Zen teacher Barbara Kosen. It was delivered in honor of the 50th anniversary of the life of Zen in the West brought by Taisen Deshimaru, Roshi, the founder of our lineage. It's a good read!